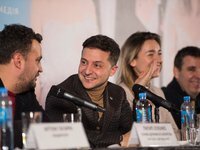 The presidential campaign team of Volodymyr Zelensky (Ze!Team) has said Crimea is the territory of Ukraine, as is well known and recognized throughout the civilized world and occupied illegally and violently by Russia. "The so-called 'referendum' cannot be considered an act testifying to the free will of the residents of Crimea, because it was held at the barrels of Russian machine guns and without the participation of Crimean Tatars, Ukrainians, even Russians and people of other ethnic origins," Ze!Team said in response to an appeal by leader of the Crimean Tatar people Mustafa Dzhemilev, who called on Zelensky to answer five questions about the occupied Crimea. Ze!Team said "Crimea was, remains and will be part of Ukraine" and should be returned to Ukrainian sovereignty with compensation from Russia for damages, taking into account compensation to the injured and families of those killed by Russian repressions. "We are not ready to give away, lease or use the sovereign territories of Ukraine and its citizens. This cannot be a subject of negotiations and agreements! Our position is uncompromising. No agreement on de-escalation in Donbas can take place at the expense of Crimea and Ukrainian citizens forced to remain in the occupied Crimea," the statement said. "…As we have repeatedly emphasized, if Crimea and certain regions of Donetsk and Luhansk regions had remained part of a free and independent Ukraine, they would already have more freedoms and authority than they will ever have under Russian authority," the statement said. Ze!Team believes there is no military solution to the conflict with Russia and must speak with Russian officials. "But this should happen with the participation of the western partners of Ukraine, and, under no circumstances, in the occupied territories of our state," the statement says. The statement says Ze!Team believes the historical sacrifices of the Crimean Tatar people and their contribution to the establishment and development of an independent Ukraine are "unconditional grounds for proposing a separate perspective for the Crimean Tatars to national development and the role after the liberation of Crimea." "We believe that this role and perspective should not be based on empty political promises. We are convinced that the Crimean Tatar people should receive a concrete plan of support and guarantees from the state and its western partners. We are confident that the Crimean Tatars will have a clear prospect of a free life together with independent Ukraine," the statement said.